I am pleased with the progress of the custom quilt that I have been working on - I think the color play is working out well. Contrasting printed fabrics with a solid linen blend fabric is always a really effective mix. This quilt has become a collection of many of my favorite fabrics and some of the squares are the very last piece salvaged from the scrap bin. I particularly love the bold large scale blue print in this image as it adds so much interest to the quilt top. This loose weave linen/cotton blend fabric is from the 2009 collection of nani IRO by by Naomi Ito for Kokka of Japan. (purchased from Mountain of the Dragon on Etsy). The plan for today involves making the backing and perhaps even basting this quilt. It does however promise to be a fine Autumn day today (welcome Autumn!) and a walk with the dog and a coffee stop on the way is much more likely. It looks just beautiful!! Love all the different fabrics. Have you ever kept track of how many different fabrics you use in a quilt like this? So glad you have an autumn day. What I wouldn't give for one of those now. Winter has been so long! 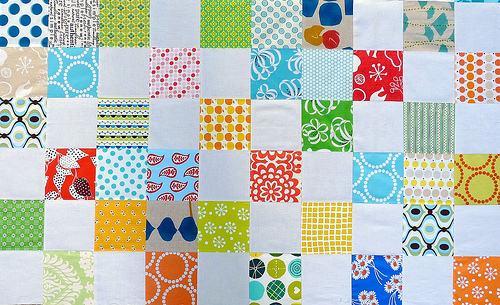 What a lovely colourful quilt - the simple design is a great way to let the fabrics shine. Enjoy your autumn day - it is still really hot over here in WA. i agree it looks wonderful ... the mix of colours is so fresh and vibrant. PS isn't autumn closing in so quickly. I can hardly believe it. Scrapy quilts are my favorite, I love all the different colors and patterns and I really like the use of another solid color with it usually white is my favoirite. I'm sure this cusotmer will be very happy, can't wait to see the whole design. I really love the way you have used a few non-white squares as some of the "background" blocks--I think it's a really modern take on a simple layout and gives the quilt a really unique and fresh feel. Thank you so much for your truly inspirational blog! A lovely combination of colours, I'm sure your client will love it. What a brisk start to Autumn! Gosh, that's loverly! 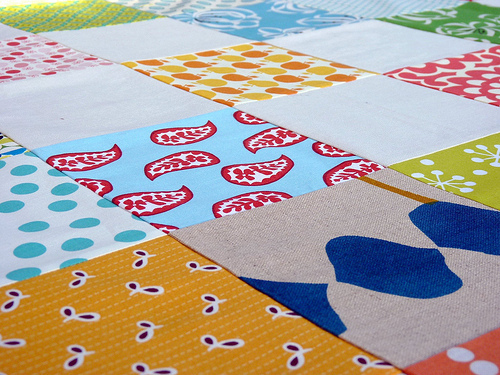 I love the bold colors and the scrappiness, those kind of quilts are my favorite! Have a lovely Autumn day...! Here, we are looking forward to spring, which is three weeks away (offically) and counting! 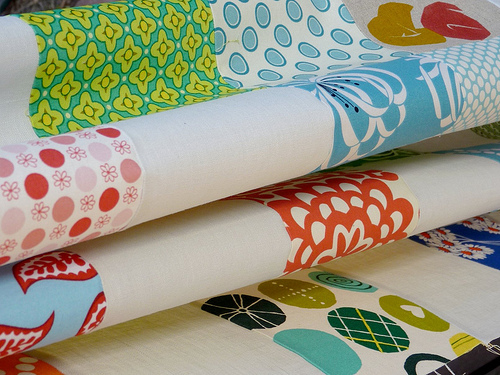 Aren't the Nani Iro fabrics just divine! I purchased a couple of metres of beautiful fabrics from Duckcloth last year, but I just haven't found the right project (a project that would be "good enough" to cut into these delectable beauties!). I'm sure your customer will love this quilt. I am 'working' on Randi's road to spring quilt-along and thought, what if its done in all squares. Well - you have answered my question. Great minds think alike huh? Love the way you mix fabrics and colors!!! This quilt looks both lively and sophisticated, the "extra" squares to the checkerboard layout makes it very interesting. Beautiful! I am certain your client will be impressed. The colours are really fresh. Your blog always gladdens my heart. Today is no exception. Thank you so much for sharing. I just love your quilts! Your fabrics seem to be so crisp and perfectly sewn and ironed. This quilt is wonderful--I just love white as a contrast to colorful prints. I have a couple questions--how small a scrap of fabric is worthy of saving for future use? And to you sort scraps by size? Nancy - I do save my scraps as small as 2 inch squares, smaller even if it is a fabric I absolutely love and cannot get any more of. My scraps are unsorted, kept in a large plastic tub. Perhaps I should sort them ... when time permits. ps I actually love rummaging through my scrap bin, it is a like a catalog of colors and prints, and can be a great reminder of the fabrics that I do have. You make the easiest patterns look beautiful. Thanks for sharing. Love your fabric selection too. And YES I SAVE MY KIBBLES TOO. Very pretty, love all the little snippets of bright colored fabrics!